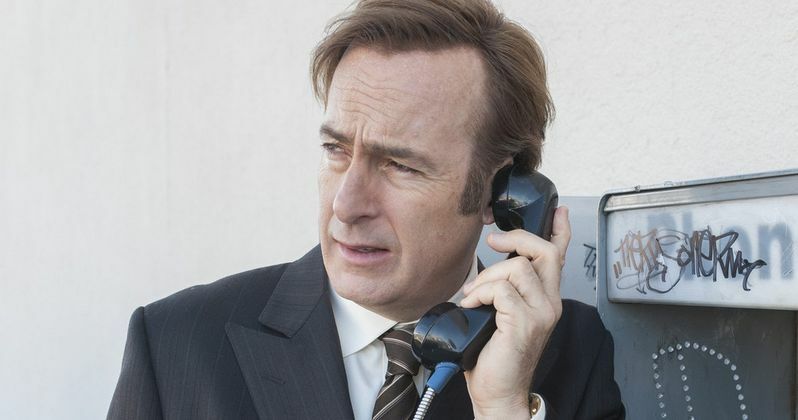 AMC's Better Call Saul is already a surefire hit, scoring the highest-rated series premiere in cable history last week. That first episode titled "Uno" opens a few months, maybe even years, after the events seen in Breaking Bad. Saul Goodman (Bob Odenkirk) is living his new life as Gene, a Cinnabon manager in Omaha, an occupation and location which was teased in one of the final Breaking Bad episodes. While the bulk of the show is set six years before Breaking Bad, last night's third episode, "Nacho" took fans back even further, opening with Bob Odenkirk's Jimmy McGill as a two-bit con man, asking his brother Chuck (Michael McKean) to get him out of a legal bind he's in. From the first three episodes, it's clear that the show will jump back and forth throughout the Jimmy/Saul/Gene timeline, and in an interview with The Hollywood Reporter, writer Thomas Schnauz explained the rules that the writing staff adheres to regarding flashbacks and flash forwards, teasing they may even set some scenes during the Breaking Bad timeline. "We are playing with the format. The whole show is a flashback, so we have this free reign to sort of jump further back in time, go way back or flash ahead or jump into the scene that is during the time of Breaking Bad or go to Omaha. We like to play around with that as long as it makes sense and we're not just doing it to be artsy fartsy. Whatever the most interesting way to tell the story is, that's what we're going to try to do." Of course, many fans are wondering if Breaking Bad stars Bryan Cranston (Walter White) and Aaron Paul (Jesse Pinkman) will ever surface in Better Call Saul, but it was already revealed that neither character will show up in Season 1. The show was already given a Season 2 renewal long before the series premiere aired, so, it's certainly possible that Walt and Jesse's paths may cross with Saul (or Jimmy) in the next season. It's worth noting that Breaking Bad star Jonathan Banks' Mike Ehrmantraut has been featured in every Better Call Saul episode, but we're still far from seeing how they end up working together in Breaking Bad. It's certainly plausible that the second season could show some random interactions Saul has with Walt or Jesse before he takes them on as clients. Would you rather see more of Jimmy in Chicago? Or Saul crossing paths with Walt and Jesse before he becomes their lawyer? Tell us what you think below.